These two are dizygotic twins. That is, non-identical. They used to be identical. How did it happen? Here’s the potted history. These Comeng trains were built during the 80s. As part of privatisation, the then-two operators M>Train and Connex took half each, and refurbished them (via EDI and Alstom, respectively). Added CCTV, automated announcements and signs, put in new seats, that kind of thing. Somewhere in this tale, you’d expect a stuff-up, right? Here it is: Nobody (eg the government) thought to ask the two companies to refurbish them in ways that kept them compatible. In case, y’know, say one company dropped-out and a single operator ended up running the whole system. So then they spent a bunch more money making the two halves of the Comeng fleet talk to each other again. But internally and externally they still look a bit different, as the picture above shows. PS. 12:30pm. I’m told we can expect more handholds to be installed on Comeng trains in the next few weeks, similar to the doorway H-bars on the test train. Next → Next post: How many places have you lived? PT “enthusiasts” may remember a few years back that Heatherdale Station on the Belgrave/Lilydale lines got an upgrade which got rid of a level crossing and lowered the railway line into a cutting. Prior to this the old “Hillside” and “Bayside” trains never seemed to venture onto the lines of the other operator, even though Connex had already taken over both of those defunct operators. However, when the Heatherdale thing was happening (which took quite some time from memory) some trains were trapped on the other side of the work, and so we saw for the first time some “bayside” trains on the “hillside” lines. Nowadays it seems the Comeng trains are pretty mix and match and you get both sorts on both of the “old” operators networks. Strangely however I have never seen an Extrapolis anywhere except the old “hillside” network, and never seen a Siemens Train outside the old “bayside” network. I’m sure I read somewhere that a Seimens could not run on some lines because of limitations of platforms etc (it would hit some of them) but maybe I was dreaming? Nathan, I think you mean Laburnum/Middleborough Road, which was in early 2007. An X’Trapolis train did make its way by accident to Caulfield last October. I have a grainy mobile photo of it somewhere. But in general yes, the X’Trapolis trains are intended to run only on the Clifton Hill and Burnley lines, the Siemens only on the Caulfield/South Yarra and Northern. Because the 38 new trains will all be X’Trapolis, you can expect more Comeng trains to spread around onto the other lines in the next couple of years. Heatherdale also got on an upgrade, which only consisted of new station buildings and shelters, funded as part of Eastlink as a token PT initiative for the areas near the tollway. There was also an X’Trapolis which sat in the yard at Brighton Beach for a few days in October last year, and they ran to Frankston in 2006 for driver training. Doubt we’ll see them in-service to either though. One would hope that the new Xtrapolis have better air conditioning than the current batch. In summer they may as well not bother, it’s as useless as a proverbial on a bull. I’d personally prefer the Hitachi, no aircon but the windows open and the air at least is fresh if hot. There also used to be an XTrapolis sit at the Westall yard around 2006/2007; I can reacall seeing it in the yard every day on the way to work amongst the Comeng and Siemens sets. These days a couple of the refurbished (sort of) Hitachis can regularly be seen in the yard which have only reappared in recent months. So why is it that the X’Trapolis and Siemens aren’t run on all lines? Is it really because of platform/size issues? Assuming that, then if the Comeng’s are another size train too, wouldn’t they have issues on some lines? 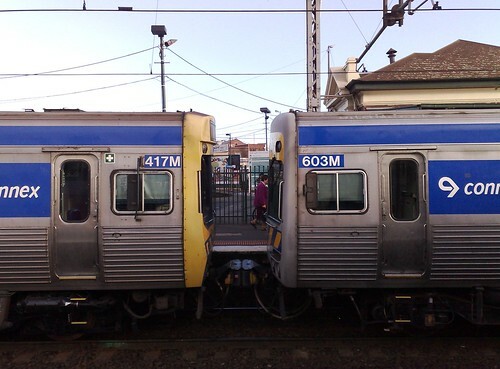 And I guess I am hearing that my line (Frankston) will not be getting any of the new trains. Fingers crossed that the existing trains get a thourough seat cleaning – the Siemens especially are ridiculously filthy. Has Connex not heard of Scotchguard??? Daniel, in what way are the various fleet modifications ‘incompatible’? Surely the basics of coupling and braking systems would be the same – or do you mean things like station announcements, emergency and other ancilliary systems? Also, is the lone sydney double-decker train (tangara?) still operating? I always got a thrill seeing that around as it was the only one around … remember that all the Belgrave/Lilydale platforms needed to be shaved by 1-2cm in order to accomodate it which must have cost a bit … saw it in the Loop a few times which just looked … wrong. Another thing to note is that Connex and M>Train both shuffled the placement of some elements of the carriages differently. E.g. Connex carriages don’t have the glass, floor to ceiling windbreakers at the door. Connex carriages have the windbreakers slightly pushed back to allow people to stand there and not block the doors. Connex carriages have two station displays at the ends of the carriage. malcolm, the 4D train you talk of last ran in service during 2002. You can buy it at your local supermarket in the pet food aisle, as it was scrapped in 2006. Liz, the trains were bought by the respective companies, and there were adjustments made to signals, platforms and platform mirrors etc to ensure they could run on each line. Because a fair number of the fleet can be switched (the Comengs and Hitachis) there hasn’t been the need to make the X’Trapolis and Siemens trains run everywhere. Malcolm: it would be secondary systems, yes – including intercoms, CCTV, perhaps PA and probably destination signs not setup for all lines. Not sure about the door locks though, which would have been fundamental. Somebody is right; the 4D (double-deck, which looked like a Tangara but wasn’t really) was scrapped. I travelled on one of these non-identical twins on Wednesday evening. It was the 5.32pm from Flagstaff towards Craigieburn. I only noticed cos I read Daniel’s posting just before I left work. They’re actually fairly common these days. Looks like the former M>Train units will get the new handles.